This Tuesday after discussing an essay by Barry Lopez about how stories are embedded in the landscape, my students and I decided to go outside to take a walk in the snow. The snow was soft and melting. One student immediately reached down to make a snowball and roll into a bigger ball to make a snowman. Her remark surprised us so that we all stopped walking. “You’ve never made a snowman?” I asked. Whatever task we had planned was suspended immediately. 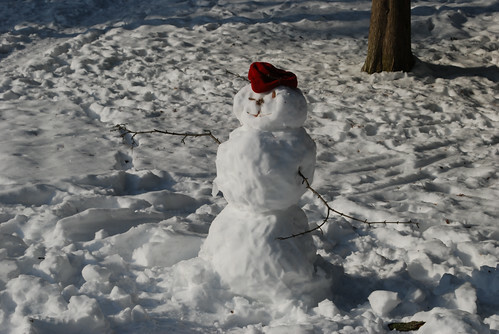 We all jumped in with our best snowman building tips. 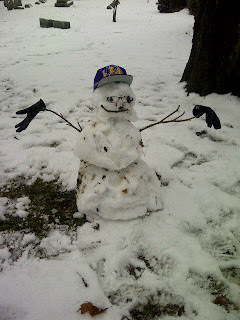 Once she’d built the little snowman, students quickly added branches for arms, a hat, glasses, and a muddy face. We went back to the classroom after that to do some collaborative writing, but I think we all felt like the important learning of the day had already taken place. Photo taken by Florida Student, with her phone. The room was dazzlingly bright and clean. It looked like the operating room in the television show Scrubs, except without the big glass window and the clever dialogue. To my right, I could see a bunch of equipment. All the people in the room were wearing scrubs and face masks so I couldn’t tell who they were; they could have been aliens. One of the aliens reached to grab my elbow. She spoke in a normal human voice, “Lie down here.” So I stretched out on a stiff padded table, the type the school nurse had in her office when I was a kid. Once I was lying flat, the alien instructed me to slide up so that my head was underneath all the equipment. I looked up and right into the eyes of the surgeon, who was sitting right behind my head. That’s all I could see. The rest of his face was covered with a mask. He pulled some stiff, padded things around my head, much like the head protection that you might find on an extreme roller coaster. He put drops into my eyes. “You’re going to feel some pressure,” he said. Clamps came down to hold my eyelids open. It felt odd, but didn’t particularly hurt. I had a flashback to the late seventies, when I was in high school, and we used these metal things to curl our eyelashes. “These are antiobiotic drops,” the surgeon said as he squirted liquid into my eyes. I didn’t care what they were; the drops felt wonderful. I focused on taking shallow breaths. I went into meditation mode. When thoughts came into my head, I let them go. I'd read about 40 peer-reviewed journal articles before making the decision to have laser eye surgery, so I knew exactly what the risks were. I didn't want to be thinking about that. I pushed all thoughts out of my head and took a breath, then another breath. The surgeon cut the flap in my right eye — I only know because he told me so, I had no sensation of cutting — and then he cut the flap in my left eye. Things went dark, except for this pulsing red light, which I tried to focus on. Everything was blurry — the red pulsing light spread across my vision, like watching fireworks without my glasses on. After each step of the procedure, I could hear the surgeon’s voice say, “Beautiful.” That was reassuring. He cut each flap and then he did the laser part. He said to me, “Okay, stay very still.” I held my breath. I couldn’t feel anything, but I could smell the burning — the way my hair smells if I lean too far into the fire and accidentally burn some of it. A woman’s voice on my right spoke. She seemed to be reading numbers off a machine. “Beautiful,” the surgeon said. Then he moved to my other eye. “Okay, stay very still.” I held my breath again. “Beautiful,” the surgeon said. He put drops in both eyes. The cool liquid felt great. “We’re done,” he said. The whole thing had taken just a few minutes. I could feel him moving the equipment, taking the clamps off my eyelids. “Can I breathe again?” I asked. I was startled to hear laughing from what seemed to be a whole roomful of people. They’d all been so quiet during the surgery I’d forgotten they were there. Once the clamps were off my eyes, I slid down the table and sat up. The room was blurry, but I could see the people, the clock on the wall, the doorway. I sat patiently for half an hour. My husband came out of the other waiting room and sat with me. He held my hand while I talked about how relieved I was to have the procedure over. My husband is so squeamish that he doesn’t even like to put drops in his eyes, so he too was happy that the surgery was done. I’d brought sunglasses, but when I walked out of the building, it was easier to just keep my eyes closed. The glaring winter sun was dreadful. My husband guided me to the car, and I kept my eyes closed all the way home. I’d been warned that my eyes would be light sensitive at first, so I’d already closed the curtains in my bedroom. The surgeon’s instructions were specific: I was supposed to go home and take a nap. I didn’t actually sleep – probably because I’d skipped the medications. (The doctor routinely prescribes a painkiller and a valium, but I had chosen not to take either pill.) Besides, it was still afternoon so I wasn’t tired. Instead I lay quietly with my eyes shut and observed the sensations. Once the anaesthetizing eye drops wore off, my eyes did hurt. I remembered the time that my sister throw sand in my eyes at the beach and my eyes hurt for several hours later; that was the feeling. By evening, the pain had subsided. I was paranoid about getting poked in the eyes, so I just walked around the house wearing the plastic goggles that I’d been told to use for sleeping for the first week. My kids found the goggles quite amusing. Things were blurry — especially lights — but I could see. I’d been instructed to use nighttime eye gel for the first month after the surgery. The stuff is pretty gross. It’s like squirting Vaseline straight into your eye. But I obediently put in the gel, which made everything blurry, and put on the goggles before going to sleep. By the time I woke up the next day, the painful sensations were gone. My eyes were a bit dry and itchy, like they used to get when I left my contact lenses in too long. But I’d prepared by buying a whole bunch of preservative-free eye drops. Every time I felt like rubbing my eyes, I put drops in instead. That worked. I wasn’t supposed to get any water in my eyes for the first week, which meant that the gunk from the gel and the eyedrops just stuck to my eyelashes, which felt a little odd. As we drove to the eye doctor for my follow-up appointment, I looked out through the windshield and marveled at the world. “I can read that sign! I can see the numbers on that house! I can read that license plate!” I announced every victory. I’d had a really high degree of pre-operative myopia, so the eye doctor had warned me that what he could do might be limited, but at that appointment, less than 24 hours later, my vision tested at 20/20. I haven’t been able to see that well since third grade. “Hey, want to go for a drive?” Quilt Artist asked. She was heading to a small town about 40 miles away to pick up her artwork after a show. Winding roads took us past little college towns, icy hillsides, and trees that looked stark against the winter sky. We talked non-stop, of course, and stopped for lunch at the whole foods store that our friend Gorgeous Eyes owns. I was hungry by then. The back of the store is sunny, warm even on that winter day. I unwrapped my scarf, took off my mittens, shrugged off my coat and then my fleece. We sat on wooden chairs at an old table with painted legs and a metal top. Gorgeous Eyes brought me a bowl of lentil soup, hot and savory, and falafel sandwich. Her girlfriend, Long Limbs, took a break and brought her own lunch over so she could talk with us. 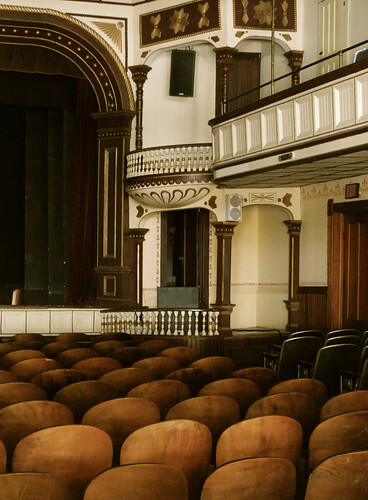 It was all so familiar: the rows of seats, the stage with its velvet curtain, the balcony in the back where school kids would throw peanut shells. Then I realized that I was remembering scenes from a book I’d read and reread as a child. Betsy, Tacy, and Tib go to a play with their friend Winona at the opera house in the center of town. “I guess I wasn’t really here,” I admitted to Quilt Artist. “It just feels like I was.” I ran up to the stage and stood there, just to see if I could feel the thrill of excitement that Betsy felt when she got to be an extra in the play Rip Van Winkle. For a moment, I was Betsy, peering out from behind the curtain to see my sisters and parents sitting in the audience. When we stepped out of the opera house into the winter sunshine, it seemed odd to see cars going past. “So many horseless carriages,” I thought to myself as we started home. When we first started the tradition of the candle ceremony, the kids were little. We'd sit around the kitchen table, the lit candles safely on the table, and each of us would say something nice about the child celebrating the birthday. Shaggy Hair Boy always played with his candle, which meant that my tender re-telling the birth story usually included me hissing, "Watch out! Don't set anything on fire." When we'd turn on the lights at the end of the ceremony, Shaggy Hair Boy would be holding a plate of misshapen wax that only vaguely resembled a candle. 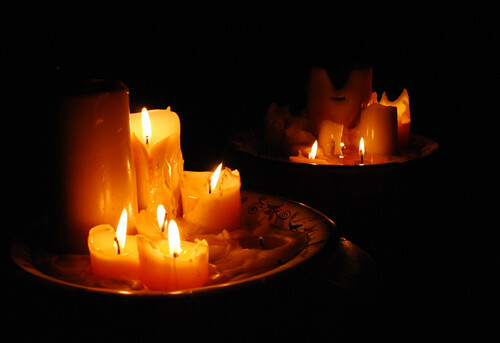 As my kids got older and extra kids began coming over for candle ceremonies, we moved the whole thing over to the living area, where we'd hold candles on our laps or set them on windowsills, a circle of flickering light. The candle ceremony expanded to include jokes, insults, and funny anecdotes, and Shaggy Boy outgrew his need to destroy the candles. Of course, now my kids (and extras) are mostly adults. During last weekend's candle ceremony for Shaggy Hair Boy, I didn't pass out the candles, but just set them on a couple of stools in the middle of the room. I'm no longer worried about little kids burning their fingers — I'm keeping dripping wax away from the laptops, tablets, smartphones, and other electronics that accompany a gang of young people. We've now been doing candle ceremonies for so long that part of the ritual is to remember what we said during other candle ceremonies, other years. My daughter remembered what she'd said about Shaggy Hair Boy when he was a just a kid, "He's the most genuine person I know." And we all agreed that it's still true. I woke up yesterday morning to strong winds that melted the remaining snow, toppled trees, and sent garbage cans rolling down the road. The river birches around the house bent almost double as they swished back and forth, the branches scraping the sides of the house. Watching out my back window, I could see the brittle old Scotch pines in my woods go crashing down. By the time the storm was over, three trees in my front yard — dead trees, not any of the ones I’ve planted — were on the ground, one narrowly missing my car. My husband sent a text messages to kids and extras to see who could help with the clean-up. My daughter and Sailor Boy stopped at his parents’ house to borrow a chainsaw on their way over. “My Dad has all kinds of cool tools,” Sailor Boy explained. 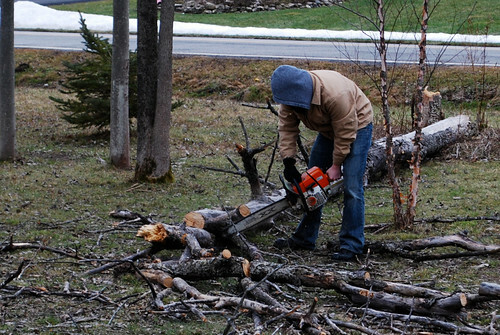 He cut up the trees, and the rest of the gang went to work, piling up logs that could be used for firewood and tossing the rest of the branches into the woods. By the time Brooklyn Friend had arrived, the front yard was clear. All that remained were piles of sawdust that will soon be covered under another layer of snow. When With-a-Why was younger, people often mistook him for a girl. His dark, silky hair was long, and his eyelashes are so thick and black that it looks like he’s wearing mascara. But no one makes that mistake any more. He’s eighteen now. He’s gotten tall, and he’s got a lot of dark facial hair. Last November when he was in the musical White Christmas, he asked me to cut his hair. He shaved and put on a suit, and the transformation was complete. He was playing the role of a fast-talking New Yorker, and he looked the part. Of course, his hair has grown over the last month, which means it’s getting shaggy. I offered to cut it again, but he just shrugged. He doesn’t really care what he looks like, as evidenced by the fact that he let his mother cut his hair instead of going to someone who knows how. “Are you going to at least shave for your auditions?” I asked. He’s spent hours practicing for these upcoming auditions – he’ll be singing and playing the piano — and his first voice audition is this Saturday. I guess there’s a certain logic to that. Pretty much everyone heard my cough yesterday. The first day of class is the one day when I have to do a lot of talking, and my words were garbled constantly by fits of coughing. My students, luckily, are a sympathetic bunch. They rooted through their backpacks to find cough drops to offer me. I think it’s just a bad cold or maybe the flu, but we’ve decided to call it the plague. That just sounds so much cooler. Today was the first day I was able to talk about the new plan with my students. They began jumping in right away with ideas that were way better than anything I’d put on the syllabus. It’s going to be a good semester. It’s a tradition. Every year, my family and friends get together over the holidays and exchange viruses. By January, we’re all sick. This year has been no exception. My ribs hurt from this deep, hacking cough. I’ve tried to sleep sitting up the last few nights because the cough starts every time I lie down. The amount of mucus I’ve expelled from my sinuses could — well, I don’t even know how to end that sentence. I can’t think of a single useful thing to do with gallons of mucus. It doesn’t even make good compost. The worst part is that everyone in my part of the world seems to have the same damned cold, and no one feels sorry for me because they’re all miserable too. They say misery loves company, but I don’t think that’s true. When I’m sick, I prefer to have healthy friends and family who might run to the store to buy me treats. I’m going to wake up tomorrow morning feeling completely better. That’s my plan, and I’m hoping my body goes along with it. Tomorrow’s the first day of spring semester, and I need to be on campus. I need to actually put on real clothes and function like a human being. And I'd like to recover from this cold before I get hit with the next round of viruses that my students will bring back from their hometowns. Yes, the man in this photo is standing in the snow IN HIS BARE FEET. When he offered to pose for my blog, I told him that my readers would understand if he left his boots on, but he wanted the shot to be completely authentic. “Besides,” he said practically. “I have to take off the boots to get my pants off.” That’s the spirit I like to see during a photo shoot. I hadn’t really planned on taking a naked blog photo. Sure, I had my camera with me, but that’s because Pretty Colour Lake is gorgeous in the snow. The trails were packed with icy snow, and the trees lined with fluffy snow. I really meant to just take some cliché winter pictures and call it a day. I was walking with my longtime friend Poet Woman and her husband. Every year, they come into town right after the holidays to visit family, and we go for a hike in the snow. We’d already walked halfway around one lake, the two of us women talking fast and furiously while Tall With White Beard put a word in whenever he could. We stopped at the edge of the second lake, a favourite place for skinny dipping, and that made me think about the naked blogging project. “It’s too bad it’s so cold,” I said. “Or we could take some naked photos here.” I knew that in warmer weather, they’d both be willing. Poet Woman once spent three days completely naked hiking in the mountains on some kind of vision quest. Her husband, a tall man with long white hair, seems comfortable with his body. They’re both in their 60s – and I’ve found that the older people are, the more likely they are to pose for me. We were just chatting about the concept of a naked photo — really, I wasn’t even putting any pressure on – when Tall With White Beard said suddenly, “Sure, I’ll pose.” Honestly. I didn’t bribe him or coerce him in any way. 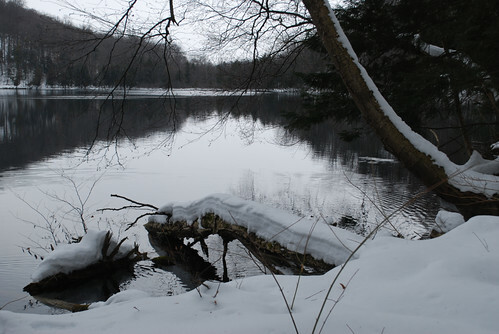 There we were, about a mile along a hiking trail, on a cold winter day, in what was a fairly public intersection, the spot where anyone on cross-country skis or snowshoes would cross to get to the second lake, and he was offering to take off his clothes. “It’s going to take awhile,” he warned me. He stripped off his gloves, took his camera from around his neck, shed his coat, his thick outer shirt, and then his t-shirt. Then came his boots, several pairs of socks, his pants, and his underwear. I think he might get the record for how many items of clothing he had to take off to pose. I snapped quickly. Some cross-country skiers had appeared at the horizon, but I wasn’t worried about them so much as his feet. I’ve stood with bare feet in the snow, and I know just how cold and painful that can be. The skiers were young and bundled in warm winter clothing. They took one look, turned around, and went back the way they came. Perhaps the long white beard unnerved them, like seeing Santa Claus naked. Poet Woman made admiring comments about her husband’s physique – and it’s true those long legs made it easy to take a good photo – but the thing that still impresses me the most is that he braved the winter cold to pose. That’s true dedication to the naked blogging tradition. I met Irish Storyteller thirty years ago. I’d just graduated from college, and he was a school administrator who hired me to develop a program to teach computer programming to elementary school children. We worked together to develop the program, I taught computer stuff to little kids for a semester, and then I went to grad school. But Irish Storyteller and I stayed friends. We worked together for years on a writing project. About once a week, I’d walk over to the beautiful old house where Irish Storyteller and his wife, Warm Smile, lived. They were about the same age as my parents. I’d gone to high school with one of their sons, and my daughter went to that same high school with one of their grandsons. They always treated me like family. I’d come right into the kitchen, and Warm Smile would offer me cookies, just like my own mother always did. She’d fill me in on all the family gossip: which of the kids had gotten a job, which grandchild had a piano recital. After every family vacation, she showed me photos: the whole gang gathered on a beach usually, everyone tanned and relaxed, usually in bathing suits and t-shirts. They had six children and eighteen grandchildren, so getting everyone together for a week-long vacation was always an exercise in controlled chaos. We'd both get to laughing as she told stories about the week. That's what I will remember most about her: that easy laugh, that gracious enjoyment of the little things in life, her pride in her children and grandchildren. This morning, on a cold winter day, all eighteen grandchildren were dressed in their church clothes. They gathered at the back of the church with their parents and their grandfather, and they walked up the aisle with the casket that held the body of Warm Smile, the grandmother they loved dearly. It’s never easy to say goodbye. Two of her sons gave beautiful talks, both choking up as they did so. Irish Storyteller held his oldest daughter’s hand, tears on his face as the violinist played. Later, we ate lunch in a room filled with flowers and piano music. The youngest grandchildren roamed about in herds: it’s clear that the cousins adore each other. When I talked to Irish Storyteller about the woman he’d been married to for 56 years, he said to me, “You know when it’s going to be the hardest? At about 4 pm every day. That was always our time. No matter what was going on, we usually sat down at 4 pm, maybe with a glass of wine, and talked to each other. It’s so important – to talk to each other.” Many times during the summer while taking a walk in the neighborhood, I’d seen them on the front porch of their house, just relaxing, chatting with each other, and watching the world go by. They’d always made time for that daily activity. I hugged each of the six children before I left. The youngest said to me, “My mom was totally amazing. And we all knew it. We always treated her that way.” That kind of summed up the feeling in the room. It was filled with love, with sadness, with grief. But no regrets. 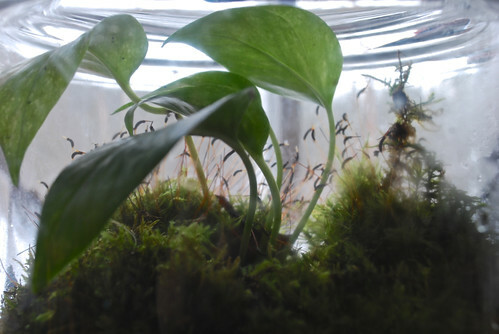 He was making a Christmas Present for Smiley Girl: a terrarium. 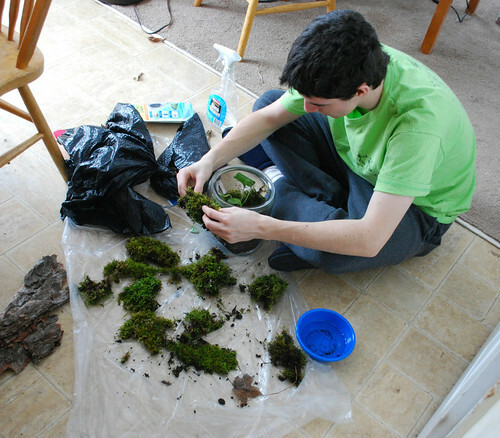 He’d been talking about the present, and he’d even gone to the pet store to buy the charcoal, but for some reason he decided to wait until there was at least a foot of snow on the ground to ask me for some moss. Outside, I breathed in the moist, cold air. Fluffy snow on every branch and stump muffled the usual noises of the woods. My boots barely made a sound as they sunk into the snow. I went to the base of an old tree in a low part of the woods, dug down to get to the moss, and selected just a bit with my mittens. Within minutes I had enough moss, but I walked farther anyhow, just to admire the way the snow had transformed fallen trees into works of white-trimmed art. Then I returned to the warm house, where my husband and kids were busy cleaning and setting up for our annual holiday meal. My friends tease me about how much I love a bowl of hot soup, but they also make sure our potlucks include several varieties. Makes Bread was stirring a crockpot of squash soup; a pot of potato-leek soup simmered on the stove. Mystic Woman arrived with a pot of vegetarian chili. I don’t see much of my women friends over the holidays. From Thanksgiving until New Year’s Eve, we're busy with our families, which for most of us means cooking and cleaning and doing the work that comes with the holidays. But New Year’s Day marks the end of the holiday season. On that day, we leave behind sleeping spouses, sleeping kids, and unwashed dishes from New Year’s Eve celebrations. We gather at the home of Makes Bread for a leisurely day of talking and eating. By mid-afternoon, every counter in the kitchen and the entire dining room table was filled with food. After eating three bowls of soup, I tried the quinoa salad with dried cranberries, the big bowl of guacamole, and the squash humus. Long Beautiful Hair carried in a plate of bacon-wrapped figs. When Loves Animals arrived with a plate full of vegan oatmeal cookies, I jumped up to grab another cup of hot tea. Outside, the banks of snow turned blue as dusk approached. We lingered for another round of food and conversation. Quilt Artist passed out photos she’d taken of us last October in the mountains: that weekend already seemed so long ago. “Well, it was last year,” Signing Woman pointed out, and we laughed obligingly. “I love this tradition,” Gorgeous Eyes said. And we all agreed. It’s a wonderful way to begin the new year — eating delicious food made by friends.